The Blackjack disposes a variety of possibilities in playing the game online. The most famous are the Blackjack Switch, Spanish 21, European Blackjack, Progressive Blackjack, etc. All the types may vary in rules, number of decks used, strategies, etc. Let's consider each of the variations of the best online gambling games a bit in detail. The Blackjack Switch has usually 6 decks at its disposal. In this type of the Blackjack once the player is dealt with two hands of two cards, he may look them up, but the player has an option to use the switch button to change the upper card in every hand before playing on them. This very manipulation costs nothing to the player, and after the cards are changed, the player may play as usual. In a case, when the dealer hits 22, all bets will be pushed. As the rule, the dealer always hit on 17. In this type of game the splitting is allowed, but re-splitting is forbidden. It means, if a split ace gets , for example, a 10 point card, the player gets 21, but not the blackjack. If the player wants to double down, he may double down after the split. Blackjack payout is 1to 1. Dealer's first card is to be one up, split aces without draw. No surrender is allowed, as well. Insurance is possible. 6 or 8 decks are used. Spanish 21 is typically played with the help of 48 card Spanish decks. They are standard 52 card decks with removed ten-spot cards. All cards are considered to have the same value as in the Blackjack. The dealer has a hole card as in the usual game. Typically, the dealer hits on 16 and stands on 17 or soft 17. Soft 17 is considered to have the bad influence on the player and, thus, increase the house edge. In addition, the blackjack wins always, and it is paid 3 to 2, no matter, whether the dealer has blackjack or not. Insurance is paid 2 to 1 like in the blackjack. Players can split into 4 hands maximum, including aces. If the dealer does not get the blackjack, players can surrender. It is interesting to know that the house edge in Spanish 21 table basically is lower than in blackjack table using the same rules of hitting or standing on soft 17. European blackjack rules are quite different from the rules of The Blackjack played in the USA or elsewhere. In this game 8 decks are used. The dealer stands on all 17. In this kind of Blackjack, the player may always count on the dealer to stand on 17, soft or differently. It is possible to split, but the re-splitting is forbidden just like in Switch. Split aces may take one next card, after that the player can stand. If they receive a 10 card, the player gets 21, but not the blackjack. Doubling down is possible at 9, 10, or 11 points at a bet equal to the player's original bet. Doubling down is never done after the split, or while dealt blackjack. Surrender is not available. This game called progressive, because allows to win the progressive jackpot. The player may decide, when to stand and bet. The dealer stands on each 17 hand. Number of decks used is 8. Payouts conducted 3 to 2. Dealer's firs card comes up. Splitting is possible, re-splitting is not allowed. 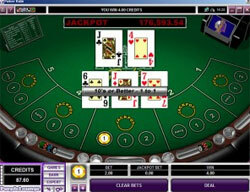 The player can use any card to double down for the bet equal to the initial bet. No surrender options, but with the possibility to insure. The player must play out every hand he started.